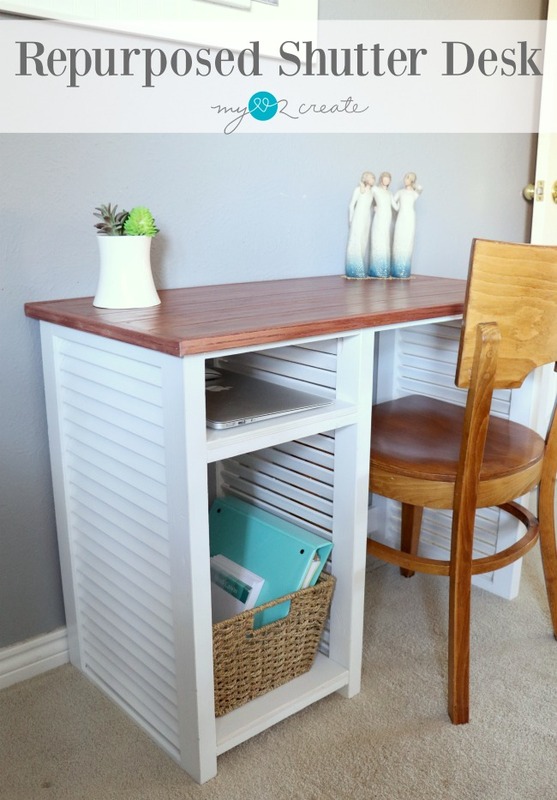 I am super excited to show you how I built my Repurposed Shutter Desk! 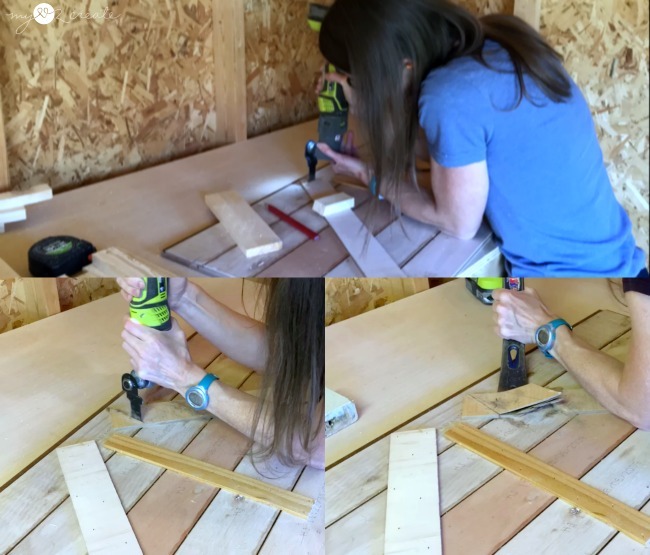 Plus, read to the end for some awesome Power Tool Challenge Team Repurposed Projects and....A Reader Challenge and Giveaway!! Fun stuff, we want to see what you can repurpose!! Seriously you guys... I have been needing a desk in my room for for-ever! But I really didn't want to spend any money. At first I didn't know what I wanted to do with them, but inspiration finally struck and I knew they would be the perfect solution to my desk issue! Supplies: *This post contains affiliate links, read more. The shutters I picked up had already been cut down and they were not straight edges. I used my Combination Square to mark a straight line on the crooked edges. Then I cut it on my miter saw. I ended up cutting my shutters to 27'', but you can adjust this to how tall you want your desk, remember you will have to add the top. I used my first cut shutter as a guide to mark my second shutter (bottom left photo above) then cut it as well. 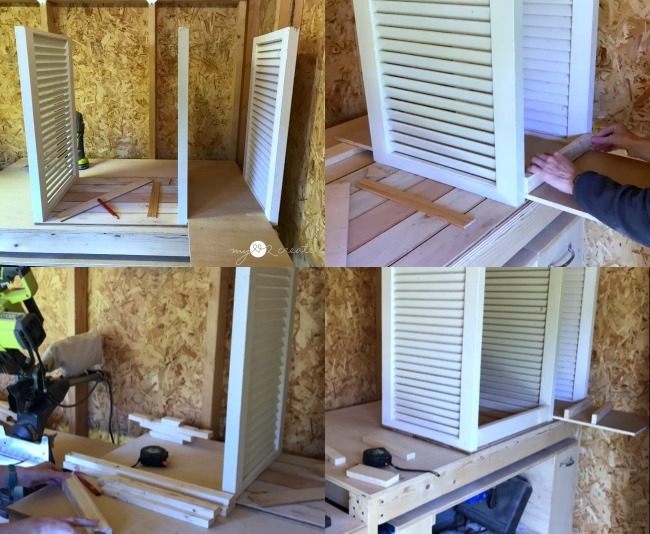 I actually started this project a few weeks back and at the time I only planned to use 2 shutters, in the top photo I was dry fitting some floor boards on top of the shutters to see how it would look. It wasn't until I started working on this project again this week, that I decided to use a third shutter to make shelves. Here is my third shutter before it was trimmed down...so crooked! The bottom rail of the shutter was much thicker. Sorry it is cut off in the photo, so I ended up only trimming a little off the top, which you can see and a few inches off the bottom. I determined how long I wanted my desk to be and then cut my floor boards accordingly. Since I used some free floor boards I had gotten off of the craig's list free section they were already cut to a shorter size. I did mine according to my longest floor boards which was 35 1/2''. Using wood glue and some scrap 1/4'' strips and a 5 gallon paint stick I secured my planked boards on the back, you can also add nails to secure them to the planks before the wood glue dries. Since I used floor boards they had tongue and groove edges on two sides that needed trimming. Once my desk top was built, I used my miter saw to trim the short edge, which was 17 1/2'' deep, I did have to flip it over, because my miter saw doesn't cut that long. For the longer side I used my Kreg Rip-Cut and Ryobi Circular Saw to get rid of the extra tongue and groove edges. When I built the top I didn't think about the top aprons (1x2's) that would attach to the bottom side of the desk top. I also didn't realize I would be adding a third shutter...so I ended up having to cut down my scrap pieces on the edges and in the middle to make room for my apron pieces and my third shutter. Oops! 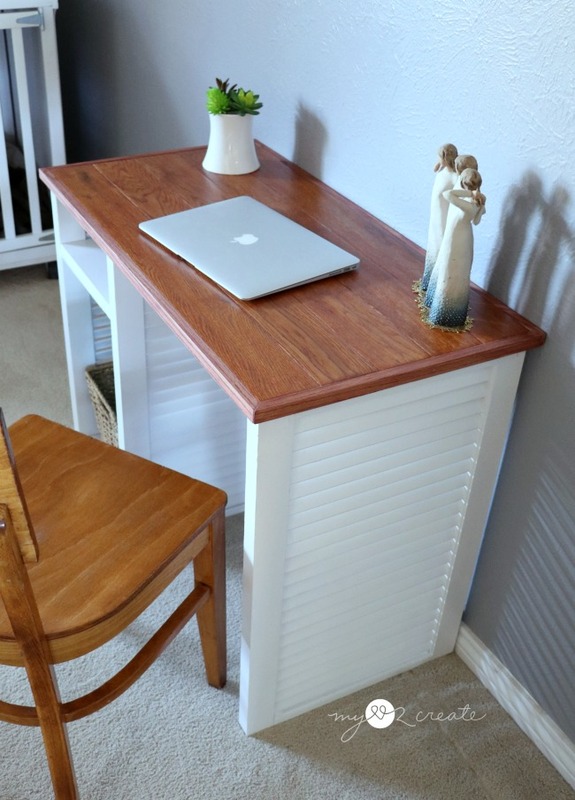 Using my desk top (upside down) as a guide I placed my end shutters on the edges of my top. Then I used my scrap plywood which I will use as my shelves as my spacer for where my third middle shutter needed to be placed. With the shutters in the proper place I then used my scrap 1x2's and measured, marked and cut, my aprons and support pieces. I cut 6 of the shorter 1x2's two will be for the top aprons and the other four will be shelf supports. I cut two longer 1x2 apron pieces, and then a 1x3 for a bottom support piece. Once I had all my pieces cut I drilled my pocket holes. Each apron and support piece got 2 3/4'' pocket holes in each end. 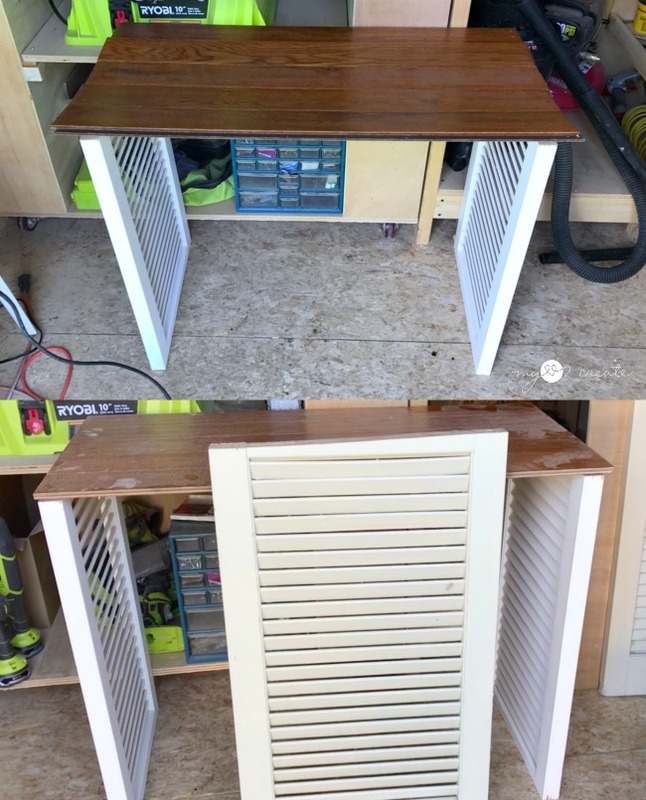 I also drilled 4 3/4'' pocket holes into the top of the shutters. These will be used to attach the desk top later on. 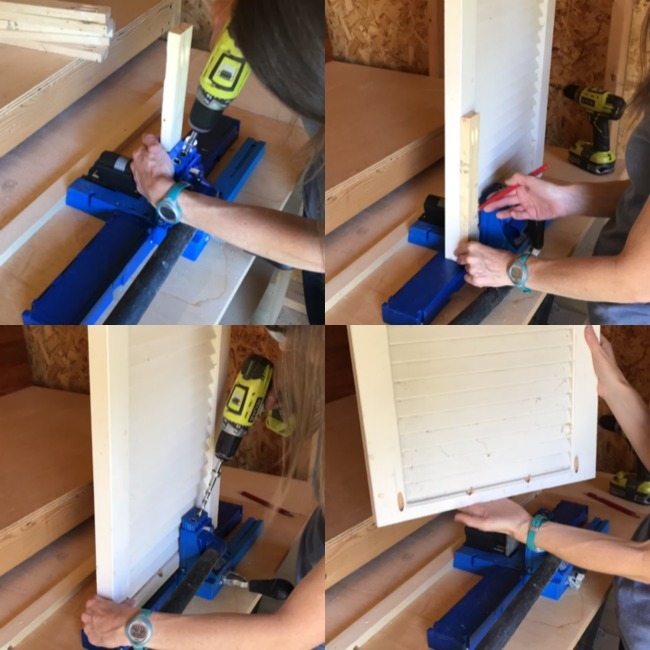 In the top right photo above you can see I am using a 1x2 as a spacer to mark where my aprons will be on each side of the shutter, this way I can drill my pocket holes 1 1/2'' over from the edge so the aprons don't cover them up. After the pocket holes were drilled then I sanded all my aprons and support pieces. 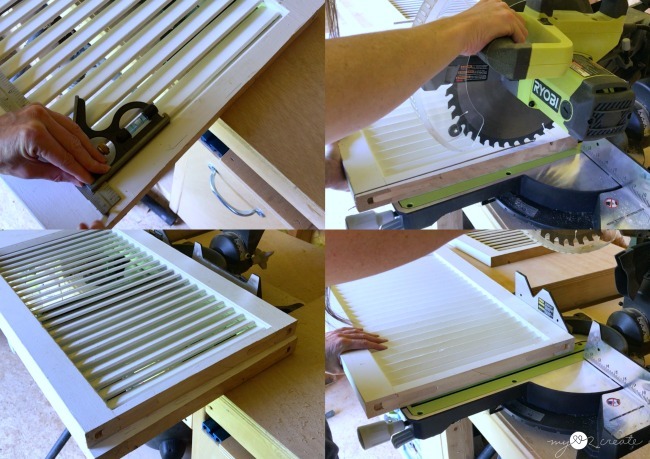 Using wood glue and 1 1/4'' pocket hole screws attach your top aprons to the top of your shutters. 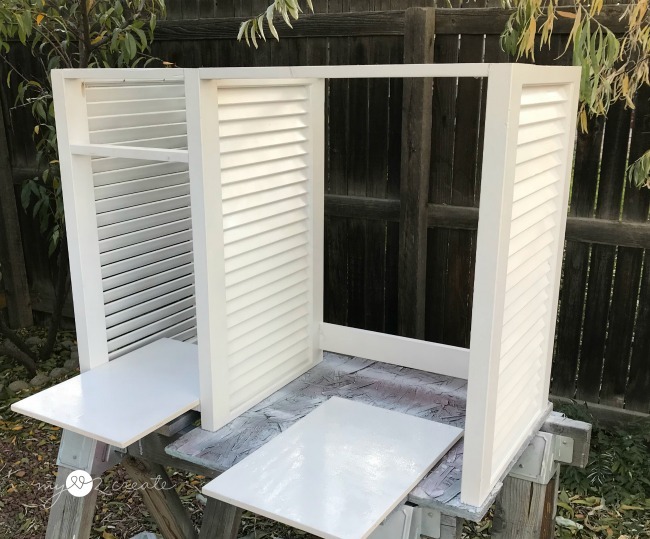 I started by attaching my side and middle shutters together with the shorter aprons, then I added the long aprons to connect the other side. 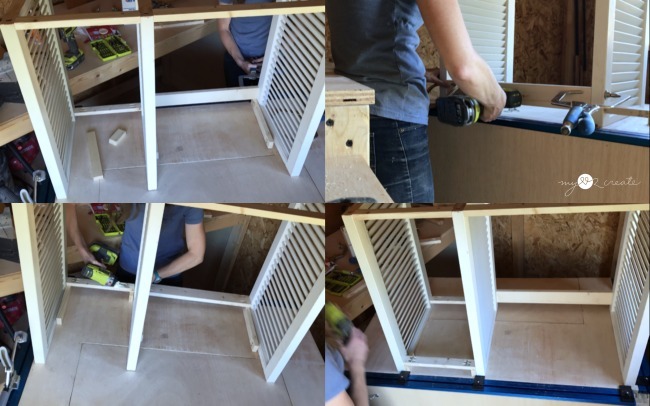 For the bottom shelf supports I used my 1x2 standing on its edge so the supports were attached 1 1/2'' from the bottom of the shutters. 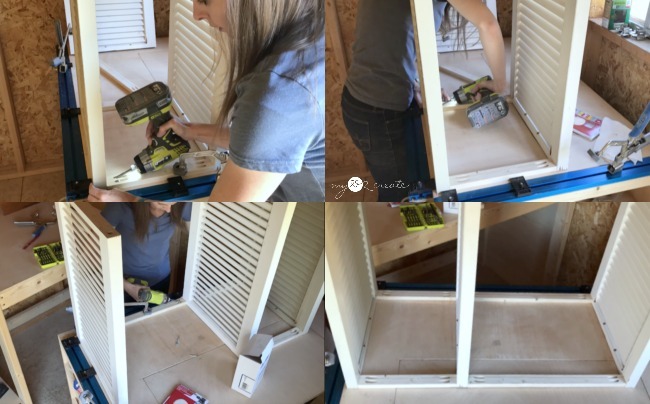 I used wood glue and 1 1/4'' pocket hole screws to attach them to the shutters, on the front and the back (bottom photos). My back bottom spacer was spaced the same way and I used my Right Angle Clamps to secure them while I added my screws (top photos). For my top shelf supports I fliped the desk over to attach them. I grabbed some cuts from a different project I am working on, and stacked them up, about 5 inches, and then attached my shelf supports. Lazy or resourceful? Hmmm, debatable. 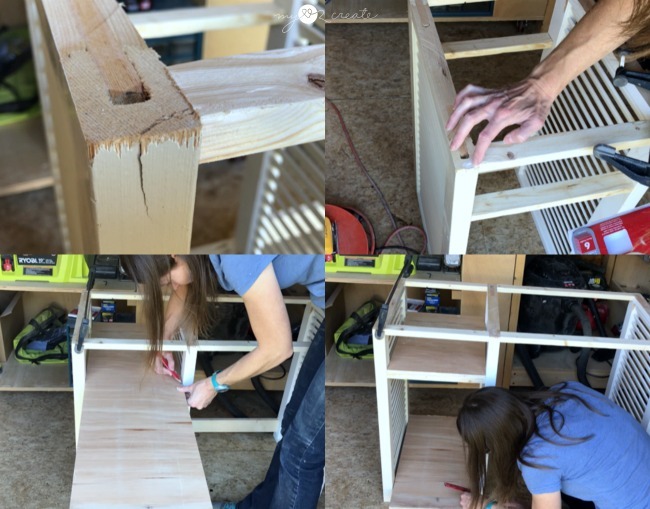 With the shelf supports in place, measure and mark your shelves, then cut and sand smooth. I had one of my shutters split a little after attaching my top apron (top left). I simply filled the cracks with wood glue and clamped it until it was dry, 30 to 40 minutes and it was good as new! Next I spray painted my desk base and shelves with white semi-gloss spray paint, Since I have a different color desk top I did this first, to make it easier. After the desk base was dry I attached the desk top to the base with 1 1/4'' pocket hole screws (top). Then I secured the shelves to the support aprons with a nail gun from the bottom, and pre-drilled holes to add screws for more strength. 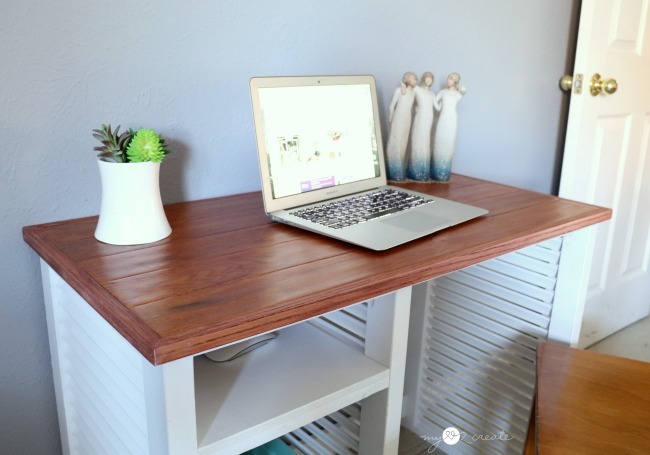 Depending on what you use for your desk top you may or may not need to trim out the edges. Obviously with flooring the edges are not very pretty. I used some 1/2'' square scraps that I also got for free from a wood stash on the craig's list free section. I cut them to fit around the desk top with the edges at a 45 degree bevel. I tried to match stain color to the wood the flooring the best I could, and let it dry. All I had to do was to nail the trim onto the edge of the desk top and I was done!!!! I love the unique look of this shutter desk, and I love even more that it cost me nothing, zilch, nada! 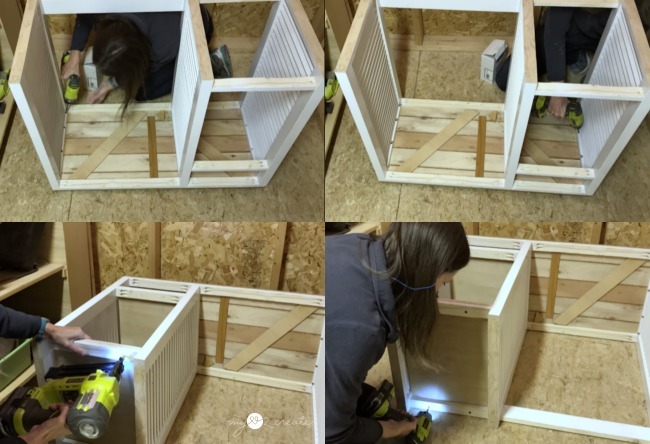 You can spy a corner of another repurposed project how to Turn a Crib into an awesome Dog Crate! Sunny loves her bed! So are you inspired to repurposed something yet? 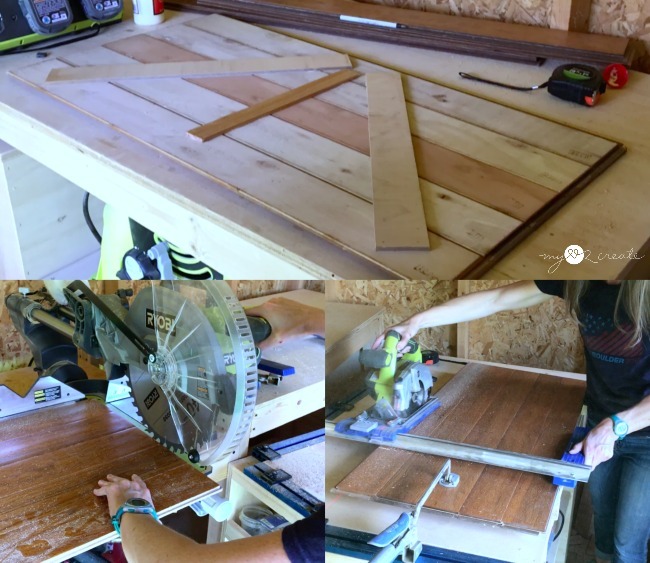 Lets take a look at the Power Tool Challenge Team's repurposed projects! Now that you’ve seen our projects, let’s see yours! To qualify, an item needs to be repurposed using at least one power tool of any kind in the process. Simple enough? Everyone can enter up to four DIY repurposed projects. There will be two Ryobi Power Tool Prizes! One random drawing and one voted Best Repurposed Project Overall. Every entry counts towards a chance in a random drawing and the winner gets to choose either an 18 Volt One + jigsaw or an 18 Volt One + Drill. 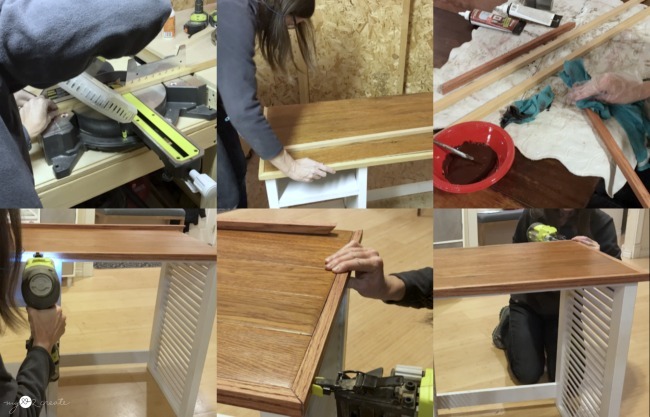 To pick the Best Overall Repurposed DIY project, the team and a Ryobi Power Tools team member will vote on their top choice. 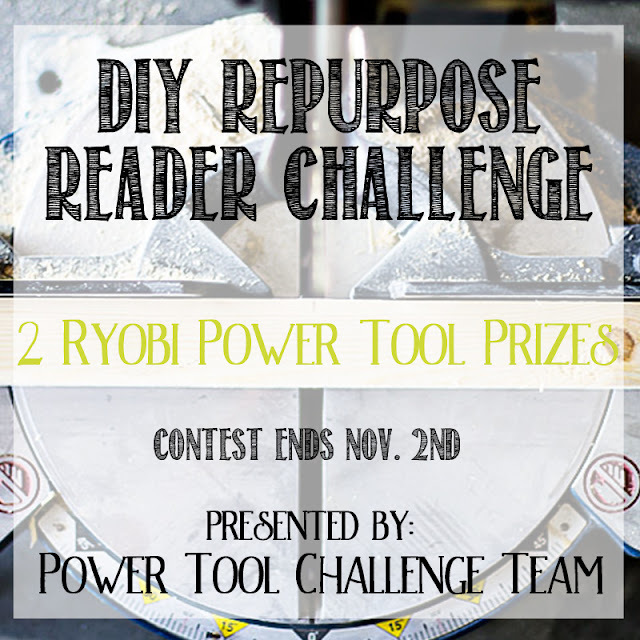 And the winner gets to choose up to $230 in Ryobi Power Tools! Enter your project in the linky below. The linky will be open for 2 weeks (ending midnight November 2nd). Readers can submit their own projects directly, make a Facebook post and share that link. 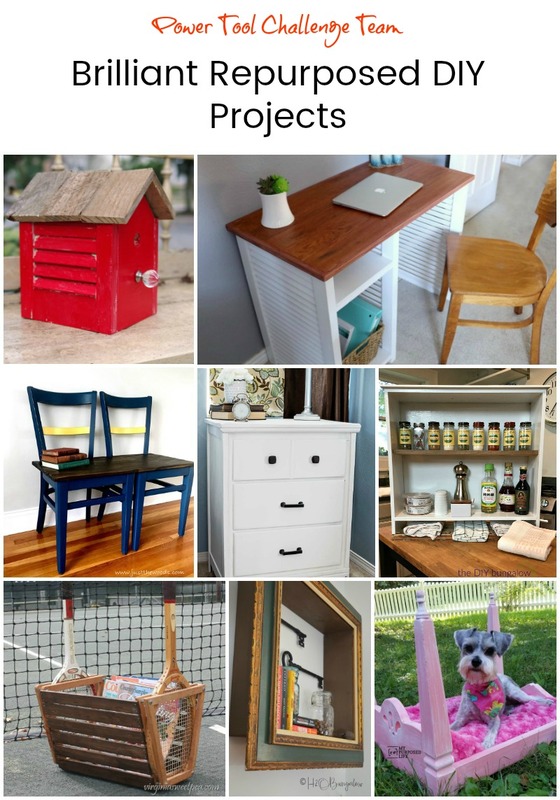 If any of you need help or want me to post your project for you just send me an email with your project photo to Mindi@MyLove2Create.com, be sure to include your name and your project title too! Must be 18 or older to win, giveaway and contest is open to USA resident only. Good Luck and have fun! I can't wait to see what you create! This is awesome! 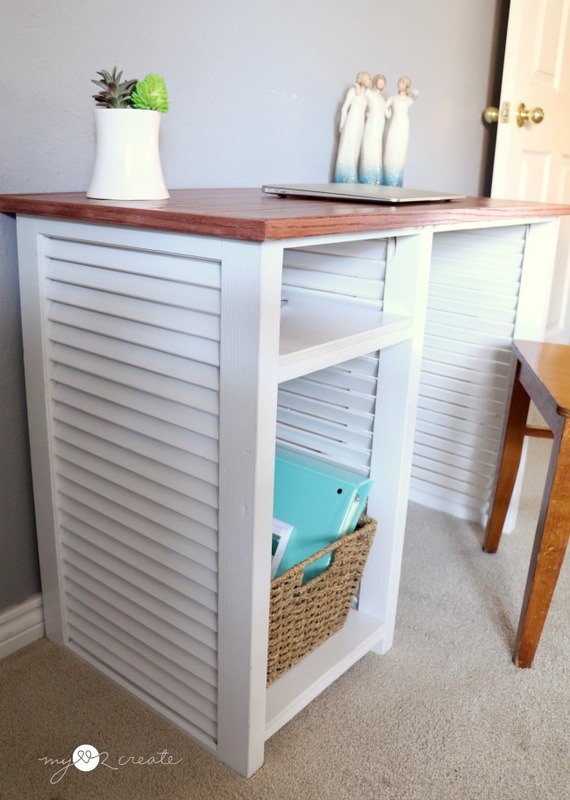 LOVE the shutter sides, I've never seen a desk made from shutters and shutters are one of my favorite repurposing items! Pinned and shared!! Thank you for sharing Wendi! I love shutter projects too, I am really enjoying my desk! What a great idea! I love how you used flooring for the top. I actually have some extra wood flooring in my shed - I think I'll repurpose it into a work table top! Thank you for the inspiration! Thanks Karen, I love that idea! I love neighbor's trash! I am always carrying something back from my morning walks on trash day! This is a great recycle, now go sell it to your neighbor! Ha ha! You are a girl after my own heart! That is such a neat desk. 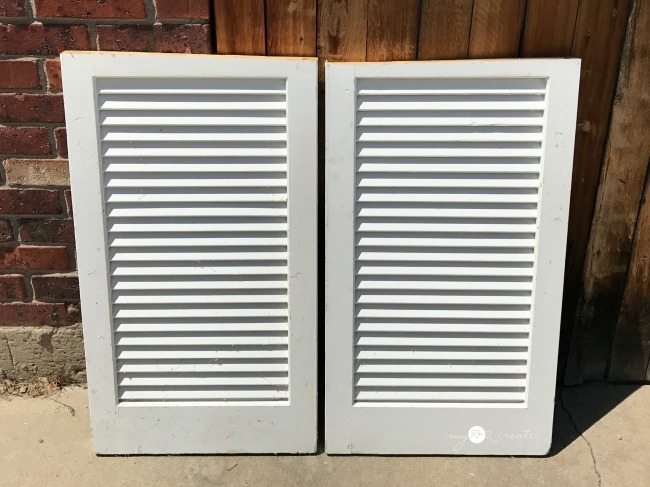 My dad had a bunch of shutters that he was trying to get rid of when he moved. At the time I couldn't think of what I would do with them and I really didn't have room for them. I've been kicking myself ever since. Awe man, I have done that before! I love the shutter sides - so clever! Thank you so much Maryann! You are so creative! 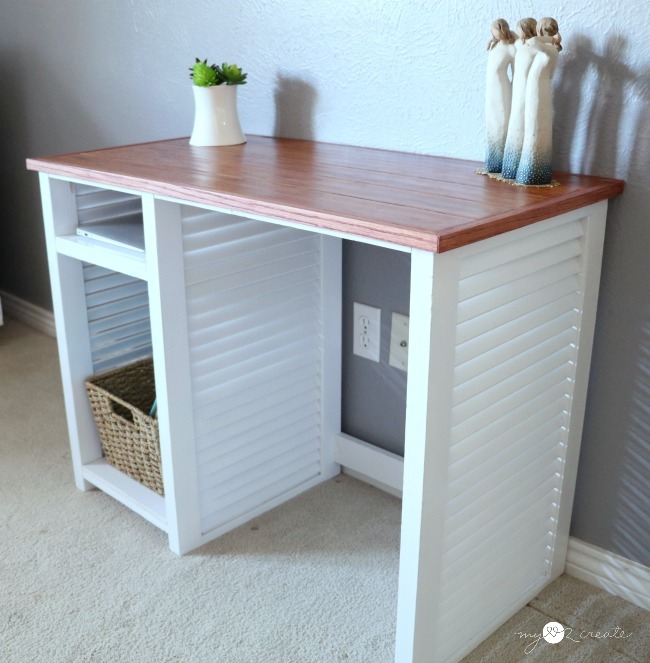 I never in a million years would have thought to use shutters to make a desk and it worked perfectly! I really like the wood floor top that you used. Such a great project!! WOW! It's NOT blue! ;) just kidding. Mindi I love your shutter desk. It is so awesome. 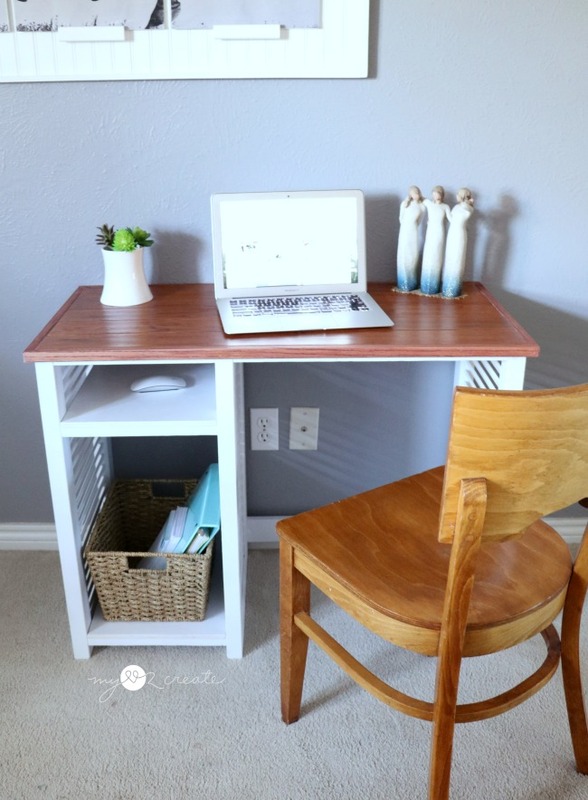 The best thing about DIY is customization--well that and your project was FREE! What an awesome idea!! I love the character the shutters add to the sides. That is the coolest desk ever! This turned out amazing! Such a cute desk. Looks like something I'd buy from a store. Thanks for sharing with our link party! Thanks for sharing with us at the To Grandma's House we go link party, I'll be featuring this tomorrow morning on my site when the new party starts!